When you check how much available disk space you have on your Mac, you’ll find that there’s a chunk of space that is not literally free, but is nevertheless available to applications. In macOS, it’s called “purgeable space”. The purgeable space mostly consists of local snapshots of Time Machine, and also caches, sleep images, swap files and other temporary system files. When an application requests more disk space than is currently free, the system automatically and instantly reclaims the corresponding amount from the purgeable space. Or else, when there is no deficit of free space, macOS allows the purgeable space to pile up to as much as 80% of disk’s capacity, by design. The system calculates the current amount of purgeable space asyncronously in the background, and often there can be a significant delay between your action and its effect on the purgeable space, from a few seconds to a few minutes. 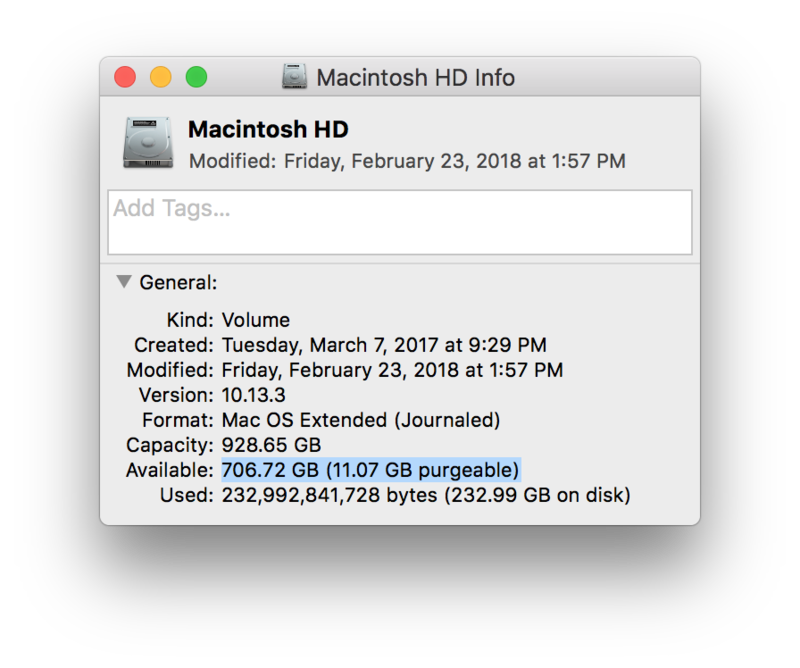 Starting from macOS High Sierra and APFS, the purgeable space is located outside of any scannable area, even with raised permissions. Instead, DaisyDisk provides a macro-level view and deletion of the purgeable space. After scanning, you can see the purgeable space when you expand the hidden space item. Before macOS High Sierra, the main component of the purgeable space — the local snapshots of Time Machine — could be revealed in restricted folder at path /.MobileBackups after scanning as administrator. In disks overview, DaisyDisk includes the purgeable space into the free space, exactly as Finder does. This allows you to understand how much space is maximally available on a disk, at a glance. The purgeable space is there by design of macOS. In most cases you don’t have to worry about it, and just let it be — it will be reclaimed autormatically as needed. However, in certain cases, a forced purge may be necessary. For example, when you need to free up a certain amount of disk space to create a partition, or simply when something goes wrong and the purgeable space seems to get out of control. With DaisyDisk you can forcedly reclaim the purgeable space by dragging the purgeable space item to the Collector, as you would do to delete a regular file or folder. This feature is not available in the Mac App Store edition of DaisyDisk. More about DaisyDisk versions. Note that depending on the amount of purgeable space, the purging may take 2-10 minutes. Also please allow a couple of minutes afterwards, until the system recalculates the new amount of purgeable space. When done, DaisyDisk will automatically refresh the purgeable space item, without rescanning. 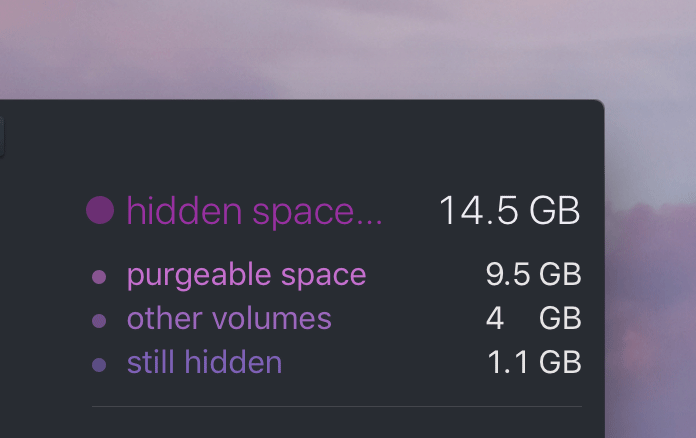 Also note that a certain amount of purgeable space (7-10 GB) will remain after purging, because macOS may not be able to release all of it, and also because the system will immediately begin building new temporary files. Because the purgeable space is instantly reclaimable, macOS counts it toward the available space, i.e. as if it was free. The resulting figure (free + purgeable) is displayed as “available” in many places in macOS and its standard apps, such as Finder, About This Mac and Disk Utility. In About This Mac on macOS High Sierra the purgeable space is included into the System category, which can often be confusing, because the System appears to take too much space, and the available space written in text is no longer proportional to the bar’s empty part. On macOS Sierra, purgeable space used to have its own Purgeable category in About This Mac.